Mohammed Dahlan, PA chairman's political rival, rules out a presidential run, supports Marwan Barghouti instead. 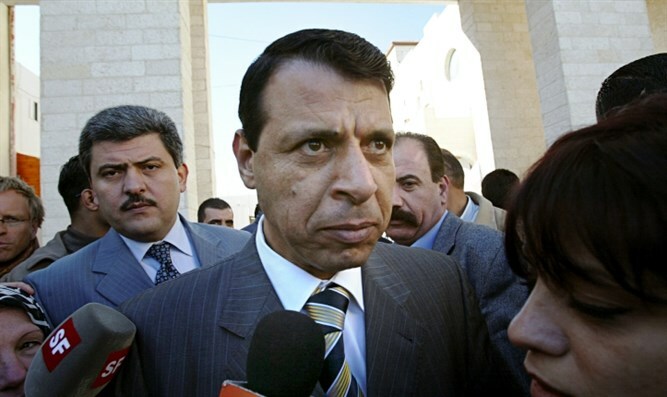 Mohammed Dahlan, Palestinian Authority (PA) chairman Mahmoud Abbas’s longtime political archrival, is ruling out a presidential run. Speaking to the PA-based Ma’an news agency, Dahlan issued a sharp criticism of Abbas and said a reconciliation with Fatah was out of the question, but also said he will not run for the chairmanship of the PA.
Abbas has accused Dahlan of, among other things, collaborating with Israel to assassinate a senior Hamas terrorist in 2002. Dahlan has repeatedly verbally attacked Abbas from his new whereabouts in Dubai. Speaking to Ma’an in an interview which was published Sunday, Dahlan severely criticized the Fatah-led PA, notably accusing the PA government of financial mismanagement and corruption. The PA, he said, complains of insufficient funds while spending "hundreds of millions on building embassies all over the world, on travel, and on delegations." The failures of PA leadership, in addition to what he described as “repressive Israeli policies”, could have dire consequences, Dahlan said. "If this situation continues, we will either yield to the occupation's conditions and rules -- which is impossible at the popular level -- or have a popular uprising, which will be very dangerous," he warned, adding that the status quo could no longer be sustained. Dahlan also said that six attempts by PA factions and Arab countries have failed to reconcile him Abbas. "At the beginning of each reconciliation initiative, Abu Mazen would agree, but at the end he would go back on his word, despite the fact that I gave up on all my rights except the right to remain in Fatah," he charged, while denying claims that he had seceded from Fatah. "How can a man who defends the honor of his affiliation to the movement day and night be accused of secession? Isn't that a huge injustice? And since when has this great movement been treated as a company or a farm, where people can be fired based on personal attitudes?" insisted Dahlan. There were reports in recent years that Israel was carrying out secret talks with Dahlan in order to convince him to challenge Abbas for the PA leadership. Other reports suggested that Arab countries were involved in the efforts to replace Abbas with Dahlan. But Dahlan asserted in the interview that he didn’t have any aspirations to become the next PA chairman. "I face this stereotypical question so often, and I always repeat the same answer: I am not a candidate, nor am I aspiring for presidency and I say this confidently and with ease," Dahlan told Ma’an. Instead, Dahlan threw his support behind Fatah leader and archterrorist Marwan Barghouti, who is currently serving five life sentences in Israeli prison for his role in planning suicide terror attacks during the Second Intifada. "This is a personal belief which I had announced long ago. It also reflects the Palestinian public's attitude through surveys I carry out, and it is now time to have free elections which the people want," said Dahlan.